My weekend was a perfect mixture of lethargy (Saturday) and movement (Sunday). My book club is reading the new Jonathan Franzen book, Freedom. You may have heard of the book because it’s Oprah’s latest pick. His previous book, The Corrections, was also critically acclaimed but it’s been about a decade since that book came out so interest in this book is high. And, for good reason. I could barely drag myself off the couch until 2 p.m. on Saturday because I was so enthralled with the book. I did make a bit of a productive comeback in the afternoon, cleaning the house and doing laundry but I could have stayed parked on that couch all day. The book is that good. 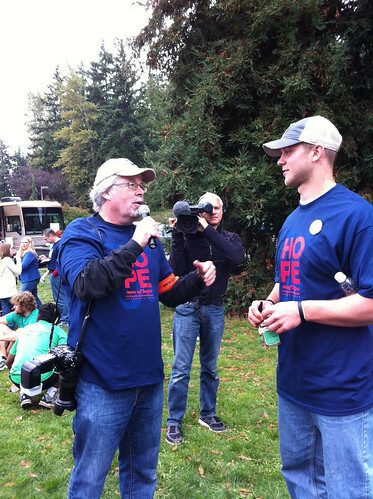 We headed down to Seattle Saturday night to stay overnight for a very special Sunday – the Run of Hope to benefit Children’s Hospital Pediatric Brain Tumor Research. You may remember my friend Kyle? He lost his fight with his brain tumor last February but his Mama has been doing an incredible job raising money to benefit the hard-working researchers at Children’s Hospital who both cared for Kyle and are still researching childhood brain tumors. She’s still fund raising for Children’s (information here). 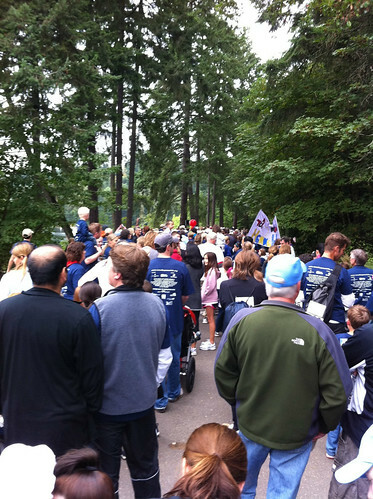 Bramble Berry was a proud sponsor of the Run of Hope this year and we were thrilled to participate in the event as well. 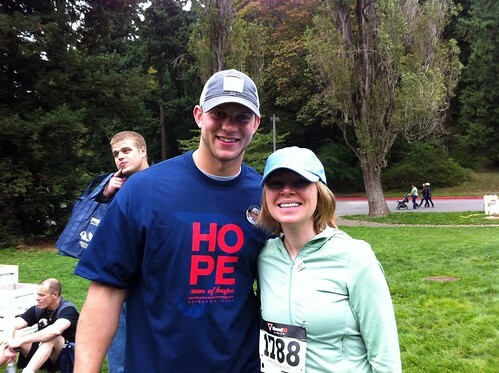 One of Kyle’s strongest supporters during his fight was Husky Quarterback Jake Locker. Jake did so much behind the scenes, coming over to play video games with Kyle, helping with fund raising and publicizing Kyle’s plight to help defray medical expenses. And, he hasn’t quit helping. Despite getting home at 3 a.m. yesterday morning from the Husky’s incredible win over the LA Trojans, he showed up bright and early to sign autographs, t-shirts and babies (yes, he signed babies; it was the cutest thing). An additional cool factor to his presence was that ESPN is covering his every move, in anticipation of the NFL draft. There was speculation that had he gone pro last year, Jake would have been the No. 1 draft so ESPN has a camera following him everywhere in preparation for this year’s draft. Overall, the day was a fantastic experience for Team OOO-UM-GOW-AH and the more than 2000 participants in the Run of Hope. Of course, we all wish that there was no reason for the Run of Hope but it was fun to meet, walk and remember Kyle while helping the team at Children’s that helped him so much. This is a blog run by one of the other RE parents if you are interested. http://rechildrens.com/blog/ It has a lot of really good information on RE. She is a rock star to go through all of that and still have the strength to make a difference! That is what I call a warrior mom. Congratulations on going through such a difficult surgery and for keeping such a good attitude during Chemo. I agree with you – any progress in any areas of brain tumor research is fantastic. We chased down every single little lead and Kyle did several clinical trials while he was sick – all to try and help the kids coming after him in the fight. He was a trooper through it all. Good luck with your continuing fight and chemo. You’ve definitely been through a lot already and we’re so pleased you’re a fan and still soaping. Wow, I haven’t heard of that brain disorder. I’ll definitely educate myself. I am so glad to hear that your daughter is doing better. That is fantastic news. Yes, Christin is a rock star to go through the 2 years of Kyle’s sickness, his passing and then just get back into fundraising and honoring his memory through her efforts to help eradicate childhood brainstem glinomas (that’s what Kyle had). I’m far from being a child but I just had a cancerous brain tumor removed in April. Had radiation and now I’m on chemo. But even though the run for HOPE is for children’s brain tumors I’m sure the the knowledge they gain with research will help those of us close to our second child hood (grin). Thank you and to all who participate in one way or another. That is awesome Anne-Marie. My oldest daughter suffers from a brain disorder called Rassmussen’s Encephalitis, which is in desperate need of research. It is events like this that give hope to families who are struggling with brain tumors and brain disorders, which are so devastating to the child and to their families. Luckily, Emily’s disease is not usually fatal and she is doing much better after a life-saving surgery last year. I can only imagine what Kyle’s family must have gone through at his loss and my heart goes out to them. I applaud his mother for working so hard to boost research in this area and you also for supporting her and calling attention to her hard work on your blog! !